Our patented solutions, completely eliminate the space constraint issue inherent to all Mobile Office applications that deploy mobile printers. 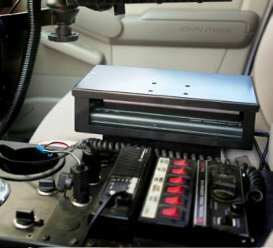 We offer "interchangeable" mounting options for both the center console and vehicle partition platforms. In-cruiser tested, heavyweight thermal paper for your Brother Pocket Jet, that consistently delivers flawless performance. We Take Your Printer Up and Away !! 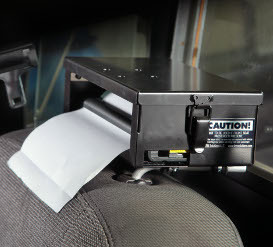 LEM Solutions manufactures a line of patented Vehicle Headrest Printer Mounts. Our products completely eliminate the space constraint issue inherent to all Mobile Office applications that deploy mobile printers. LEM Solutions headrest printer mounts literally take the common space constraint issue "up and away" by securely mounting the printer on top of the passenger seat...the perfectly practical solution to a universal problem. Some of the fastest growing Mobile Office applications in the Law Enforcement vertical are electronic ticketing or eCitation systems. To date, over 600 separate Law Enforcement agencies have deployed our headrest printer mounts and the number is rapidly expanding. Our Law Enforcement customers have helped LEM Solutions hone a solid reputation for product excellence and a "can do" service attitude. LEM Solutions, LLC line of Headrest Printer Mount products are protected by U.S. Patents 7637566, 7874612, 8336959, with an additional patent pending. These patents cover any headrest printer mount design that allow the attachment of a printer or a printer accessory component (3rd party printer mounting device, charging cradle, locking/non-locking mount, and similar), upon which a printer may be attached. Visit our reseller page to find a reseller in your area, or contact LEM Solutions, LLC directly for more information. We also offer center console and partition mounting options. Our conversion kits provide you with an "interchangeable" mounting option, to leverage future changes to your fleet and protect your investment. We believe that we have the best price/performance thermal paper program in the industry. 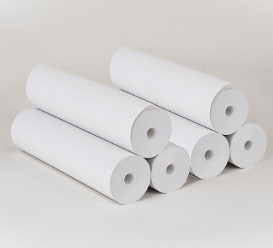 Please visit our online store at www.lemsolutionsmarket.com to purchase quality Brother PocketJet Thermal Paper Rolls at a great price!